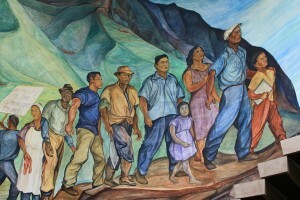 The mural “Solidaridad Sindical” was painted by famed Mexican muralist Pablo O’Higgins. The mural was commissioned in 1952 as the visual centerpiece of the newly built Honolulu ILWU office. 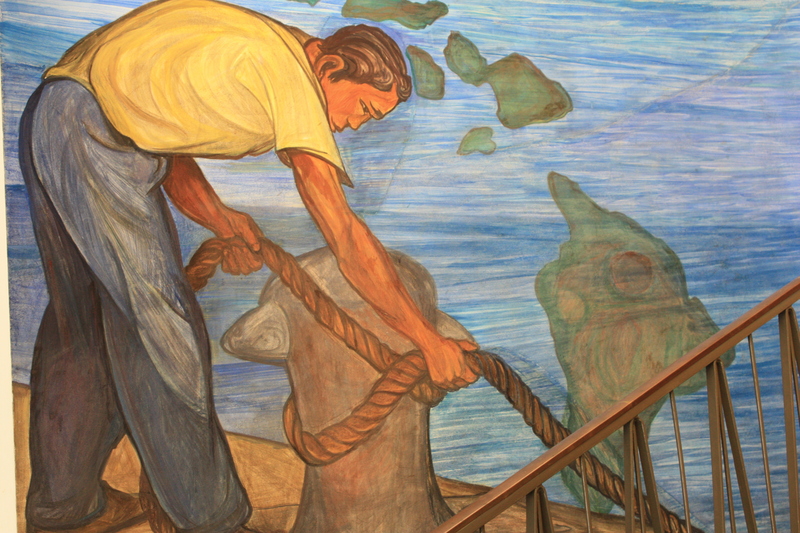 The three stories high mural tells the story of the oppression, struggle and victory of Hawaii’s working people—the story of the ILWU. This nationally recognized work of art is composed of three panels that flow upward through the core of the building. 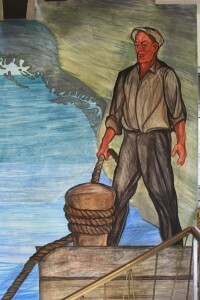 The FIRST or LOWER PANEL: On the left an island longshoreman makes fast a line, the other end of which has been secured to a bollard by the West Coast longshoreman on the right. The line symbolizes the solidarity between ILWU members here and on the coast around the principles of the Union. 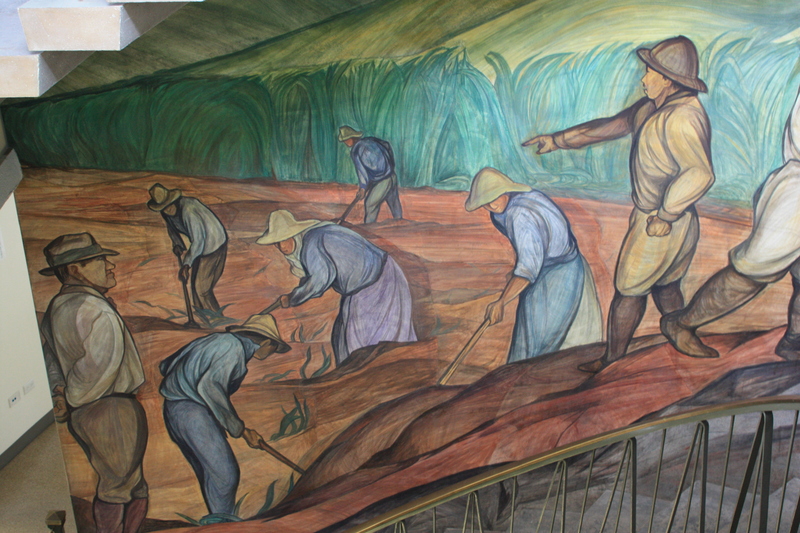 The SECOND or CENTRAL PANEL: Portrays the life of workers in the years before union organization. On the left shows a plantation manager observing his workers, who are divided into a Japanese group hoeing weeds and a Filipino group cutting cane on the right. 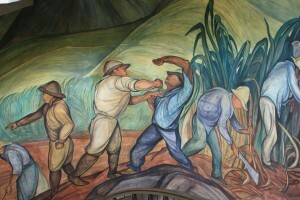 A burly overseer is striking a cane cutter, while most workers continue to toil with downcast eyes. 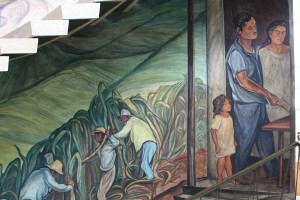 On the extreme right in a flimsy plantation shack a Portuguese-Hawaiian family sadly looks at a pay envelope, almost empty after deductions for store bills and taxes. The THIRD or TOP Panel: Expresses what Unionization has meant to ILWU members and to the community as a whole. 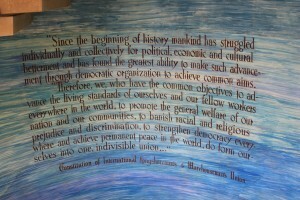 They are the triumph of interracial unity, economic and political democracy, and hope. 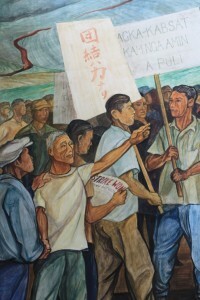 The Hawaii Labor Heritage Council, a non-profit organization, undertook the task of preserving and protecting this historic work for the people of Hawaii. 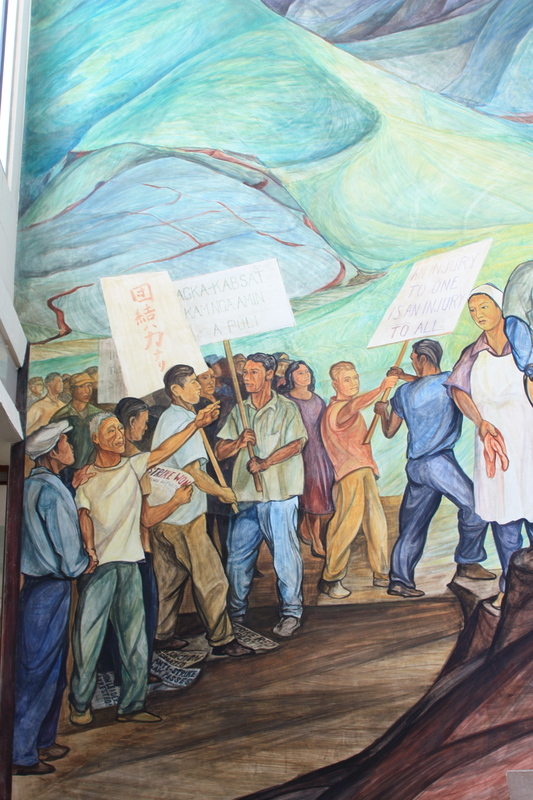 In 2001, conservators from Mexico’s Instituto Nacional de Bellas Artes spent several months working to repair damage to the mural that had occured over the years. If you would like more information or would like to visit the ILWU to view the mural, please call (808) 949-4161.